The first phases of Digital Cinema and HDTV have matured. Companies are now assessing what to do next for growth and are making their moves now. The transition from the analog world of entertainment to a Digital Media world was based on "Old Rules". That is, Digital Media solutions have been focused on substituting digital for analog. It is like when TV was first available - old radio shows were moved to TV. It wasn't until TV got a bit more established that TV became its own medium. Now that the entertainment world is comfortable with the transition to Digital Media, people are now asking why some of the "old rules" are there. A simple example is the old rule that movies should be shot at 24 frames per second - an old rule from the 1920s. The Hobbit is the first "tent pole" movie shot in 48 fps. 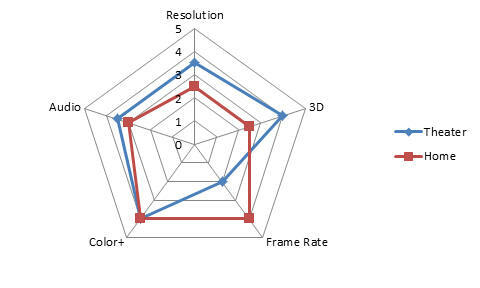 It is helping to set a New Rule that movies don't have to adhere to 24fps. But, the New Rule is a bit more complicated than just saying 48fps is coming - there is a paradigm shift that is now possible to think about that provides a better experience without having to incure the costs the Hobbit absorbed. The New Rule we are hinting at is explained in this report. This report looks at five elements of the digital entertainment experience in the theater and the home. It summarizes the current situation and rules that the industries have followed so far. This report then goes on to list 14 New Rules that point to how the industry is (or may be) moving into the next phase. Whenever a company seeks growth, a good place to look is where there is change. These New Rules mean change for companies involved in digital cinema, television, consumer electronics, storage and networking. Find out what these news rules are and where these opportunities may lie.